I know what it is - do you? 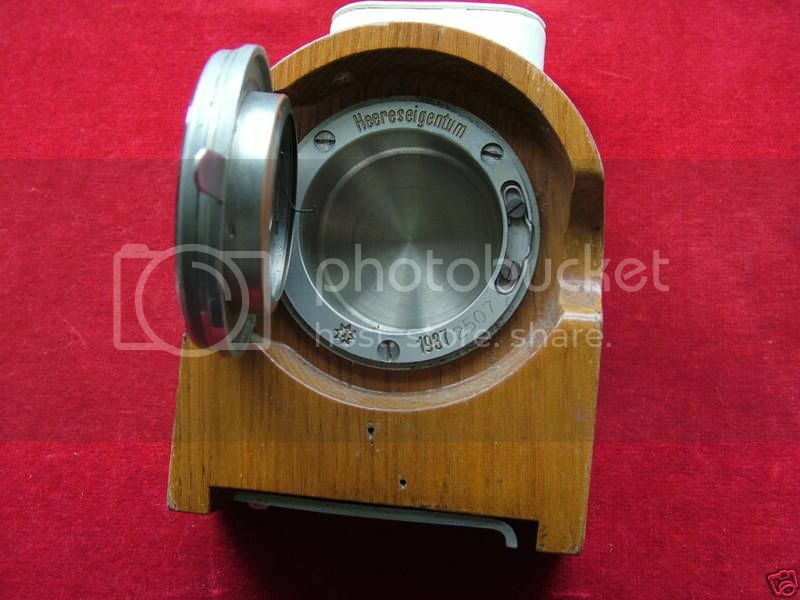 I'll give you a clue, the metal bars underneath (which you can see in the photos) fold out to stabilise the clock. Also, the two small holes front and back suggest that a badge was removed - it looks like you can just see the very feint trace/indent of a circular badge. Sometimes they had a leather carrying case. Last edited by StampeSV4; 20-01-2010 at 16:10. Artillery timer...? 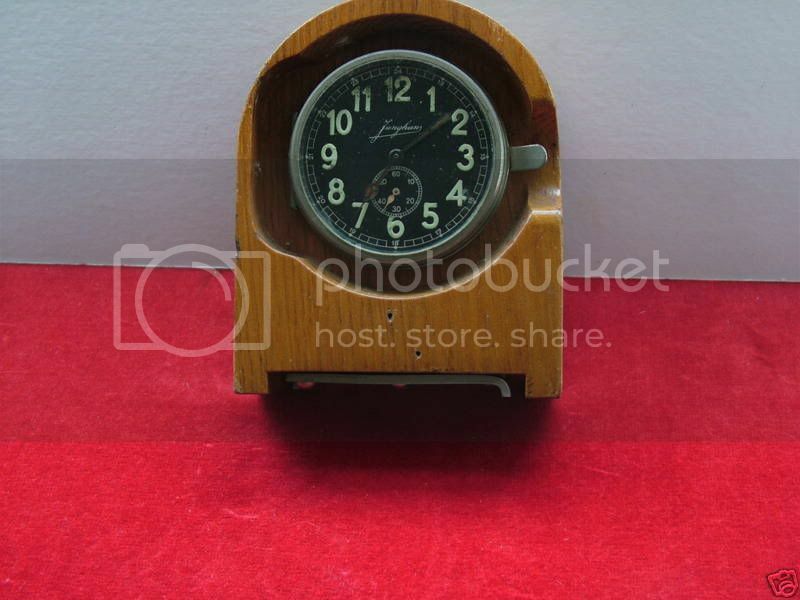 Radio room clock? U Boat? or S Boat? Could one of you be right? Any more guesses? As to badge, not a clue, maybe a regimental one? It does look like it is missing the winding and setting mechanism (see 2nd photo, no knurled wheels as seen in the post above), but I may be wrong. Everyone was right and thanks to DaveS for that interesting link. The one shown in the link on Thierry's post was very accurately described by the sellers, who made it clear that it was not an aircraft clock - what a refreshing change (they also provided the costumes for the German bomber crew in one of Disney's Narnia films). From what I gather, these were all supposed to be be painted in different shades of grey (according to which service they belonged to) when war broke out but it seems many were not. The one shown is an earlier example and so somewhat rarer than the more numerous ones made later on in WW2. I don't know what the missing badge was and have not seen another like it but perhaps this one's condition and the absence of paint suggest that it was used somewhere important, hence its survival? They were first produced in 1934 by Junghans for use by the Reichsheer, a limited army of 100,000 troops allowed by the Treaty of Versailles. This earlier clock should have a nickel silver plated movement case, back plate and swing-out stabilisers. From 1940 onwards these parts were usually made of cheaper materials such as zinc. The clock was free-standing (helped by the stabilisers) or could be hung on a wall. These clocks were used in every moving or static radio post, long distance communications outfit, telegraph and switchboard, as well as every single army admin' post. They were also referred to as use-clocks, desk-clocks, table-clocks or service-clocks. DaveS is right - it did need a repair but was complete. I received a pm from someone about this - were you lucky? Last edited by StampeSV4; 31-01-2010 at 13:02.